Trouble getting your kids or even yourself to put down the smartphones long enough to actually eat breakfast? Well, that's obviously not going to happen. 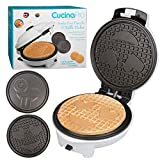 However, if you ever get hungry enough to take your eyes off the mesmerizing glowing screen for just a few minutes, you can whip up breakfast and pretend like you're texting at the same time on this cool new Emoji Pancake and Waffle Maker. Yep, it's an electric griddle that makes pancakes and waffles in the shape of face emojis like the winking face with a stuck-out tongue or the smiling face with heart-shaped eyes. It features four removable interchangeable plates, a nonstick cooking surface, and an adjustable browning and temperature control. If you don't know how to make pancake or waffle batter, I'm sure there's a recipe app for that. Too bad all of the emoji faces aren't available, then you could serve up emoji messages to everyone at the table.